The POWERPLAY P16 system is the easy, affordable way to give live or recording musicians/vocalists what they really want - "more me!" 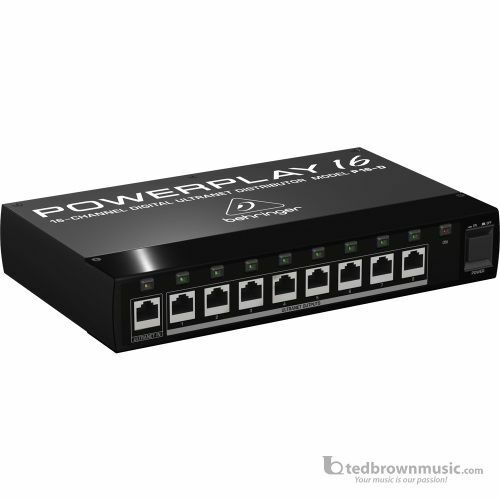 When used in conjunction with your X32 Digital Mixing Console, P16-I Input Module or S16 Digital Snake, the P16-D distributor can provide 8 additional ULTRANET RJ-45 outputs, giving you the power to expand your existing P16-M system (up to 48 stations). In addition to sending 16 channels of digital audio to the P16-M mixers, the P16-D also supplies operating power, totally eliminating the need for power adapters - and creating a much more streamlined stage or studio environment. Fast and easy to set up, a basic system can be installed and configured in a matter of minutes - and the system can be expanded to adapt to changing needs. The POWERPLAY P16 Personal Monitoring System puts total control of the monitor mix into the artist's hands, and when they can hear exactly what they want and need to hear - their best performance is unleashed!